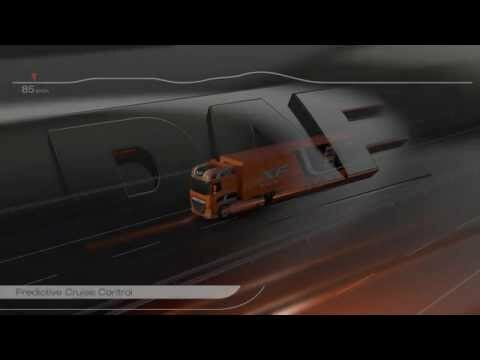 Predictive Cruise Control - DAF Trucks N.V.
Predictive Cruise Control (PCC) uses advanced GPS-technology to determine the exact position of the vehicle and to know which driving conditions have to be taken account of over the next 1 to 2 kilometres. The starting point for both technologies is to drive as long as possible in the highest gear possible and consequently in the optimal rpm range. As the vehicle nears the end of a hill climb, the system strives to stay in a higher gear. If a hill climb is immediately followed by a descent, less fuel is injected before the top of the climb, making use of the vehicle mass to ‘push’ the vehicle over the top. In some cases, Predictive Cruise Control will permit the speed of the vehicle to fall below the set value; for example when the top of a hill has almost been reached and the system ‘knows’ that the potential energy will quickly bring the vehicle back up to the desired level on the descent. Predictive Cruise Control can even temporarily permit a speed that is slightly higher than that set - within predefined tolerances, of course - also with a view to lowering fuel consumption as much as possible. Thanks to Predictive Cruise Control and Predictive Shifting, fuel consumption and CO2 emissions can be reduced by as much as 3%, specifically over hilly routes. Temporarily allow higher or lower vehicle speeds to reduce the amount of fuel used over the total distance. Fuel savings from lower engine speeds. The Advanced Emergency Breaking System (AEBS) further reduces the risk of a rear-end collision by applying up to the maximum available brake power if appropriate. PCC includes a Forward Collision Warning (FCW) function to alert the driver if manual intervention is required. Radar continuously measures if there is enough room to prevent a collision with the vehicle in front. The GPS and road map information allows better tuning of EcoRoll to the gradients and height differences of the road ahead and results in an enhanced EcoRoll function, and hence higher fuel savings.